Using parts of my drawings and photographs, one on top of the other, I build up the structure of a painting. In a recent piece I ripped out and then transferred parts of three different somewhat random photos to form the composition. The first image is a cropped view of the side of a house. 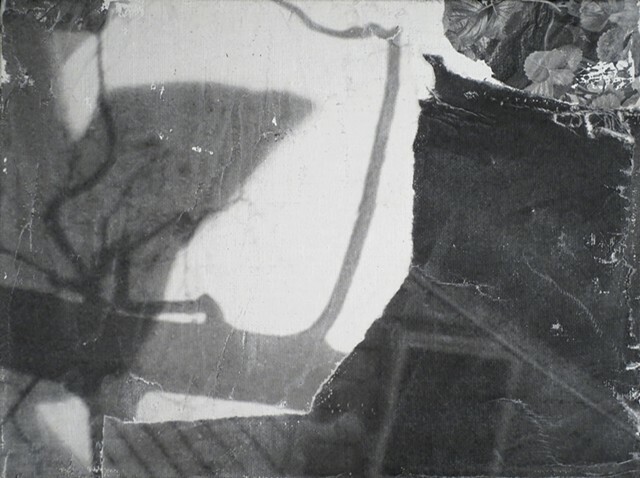 The second image is a tree trunk and a few branches, but a peculiar shadow falls across the photo’s surface creating a flutter between the tree and the fiction of the tree. The final picture is of a bushel of strawberries. Transferring photographs in this way references collage artists like Rauschenberg and Schwitters. By making deliberate and spontaneous decisions I feel more like a median in my practice, each piece revealing itself through it’s own generation. In the end I find a fractured portrait of a place that is ambiguous yet familiar.